Well, don’t say Rob Ford isn't good for nothin’. 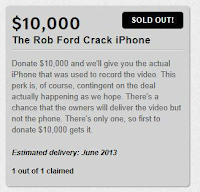 Gawker announced today four Ontario based charities that would be receiving equal parts of the crowdfunding campaign they launched to buy the video of Rob Ford smoking Crack (aka the Crackstarter campaign). The plan was to buy it and then publish it for the world to see. 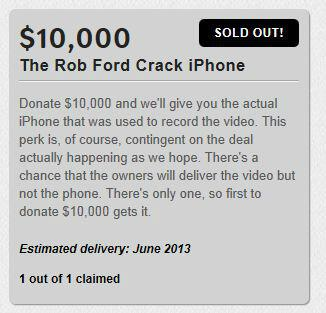 They successfully raised the $200,000 they needed to buy the video from the sketchy individual who possessed it. Shortly after the campaign started the video contact went off the grid. Gawker was upfront with people about this saying that they would do everything they could to get the video, but no guarantees…but the money still rolled in. 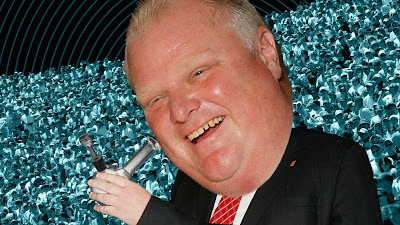 Gawker had stated from the beginning that they would donate all the money raised to a Canadian non-profit that addressed substance abuse issues if they passed their goal and couldn’t recover the video. So then the debate started on which organization to give the money to. Not sure how they ended up narrowing it down, but each of the following 4 organizations will be receiving $46,195.65: The Somali Canadian Organization of Etobicoke, The South Riverdale Community Health Center, Unison Health and Community Service and the Ontario Regional Addictions Partnership Committee.